A Welsh slate plaque has been installed at the Alvechurch village centre garden that has become a focus for tributes to teacher Pete Rippington since the school ski coach crash last year. 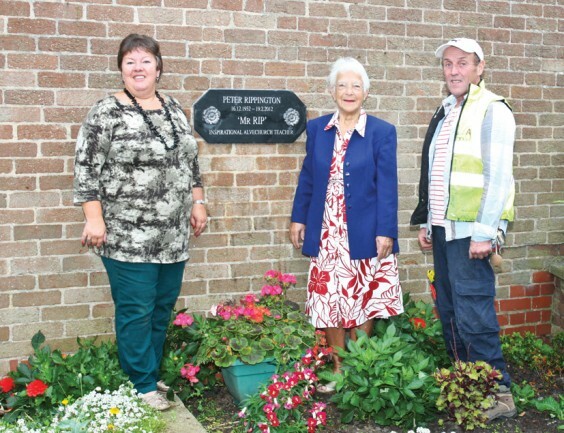 The Ffestiniog slate was supplied by Tom Molloy, of Alvechurch Roofing, whose three children were all helped through school by ‘Mr Rip’, and Sharon Rippington had the tribute to her husband engraved into it. “Pete was born in Alvechurch, lived in Alvechurch and worked in Alvechurch, so this is very fitting,” said Sharon, pictured above with Pete’s mother Lorna Sage and Tom Molloy.